Morocco — simply saying the name inspires images of an exotic and exciting location. I don’t know of a single other place in the world that has that same effect for me. And I am not alone. 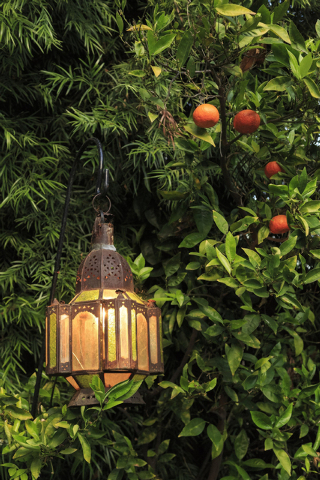 Ricardo DeAratanha/McClatch-Tribune News Medea A Moroccan hanging lamp among citrus in a garden. This type of lamp also could be hung indoors. Jacob Langston/McClatchy-Tribune News Service Turkish chairs rest in the corners of a Moroccan-themed billiard room. Walking through the airport recently, I saw posters promoting the allure of Morocco. Casablanca, Marrakech — can you get any more romantic? Many of us will never have the opportunity to travel to this intoxicating land, but we can bring Morocco to us. Designers are using Moroccan furniture and accessories to create a look that is luxurious and to bring a touch of the exotic into our lives. The effect of Moroccan designs can be powerful and soothing. The country absorbs elements of surrounding cultures: France, Spain and Portugal. It is also strongly influenced by proximity to the Mediterranean, Africa, Persia as well as traditions of Islam. When all these cultures, colors and traditions mesh, a unique style emerges. 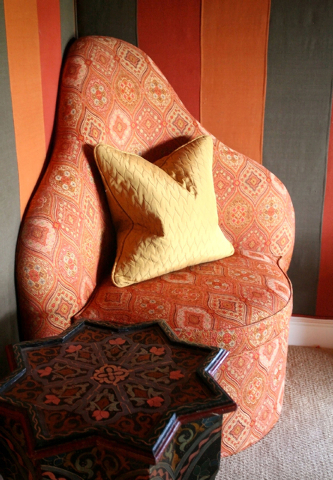 Color and craftsmanship are the two defining elements of Moroccan décor. The colors are designed to punctuate the surrounding sea, sand and sky of the country. Light is an essential element of the Moroccan style. Natural light floods into Moroccan homes. Lighting fashioned from metal, colored glass and wood creates a romantic mood within the interiors of Moroccan residences. Craftsmanship is evident in even the smallest accessory. 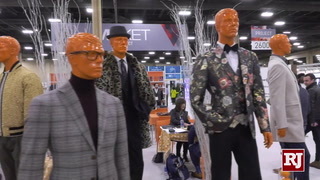 Textiles are influenced by lush, rich, beautiful saturated colors. But the weight of these fabrics is light and airy, providing a sense of floating through space. The rugs are soft and patterned with tribal motifs or simple light-colored prayer mats. The furniture is powerful and alluring. The intricate use of mosaic patterns, inlaid with stones, shells, glass and ceramics are unique to Moroccan furnishings. Place a Moroccan table in a room and it demands your attention. Of all the reasons to love Morocco, for me it’s the furniture. Unlike some other design styles, it is happy to play well with others. Just one piece can accomplish so much. Moroccan lighting casts a spell like none other. The light pattern created by the tiny pierced holes in the metal or wood shades sends thousands of little sparks of light dancing on the walls, ceiling and floors. Add colored glass to these fixtures and the effect is magical. Mosaic tiles are one of the most recognizable aspects of Moroccan art and architecture. The colorful designs are busy and work best when used as the only accent in a space. Keeping the surrounding surfaces neutral and unadorned allows the true beauty of the tiles to explode.